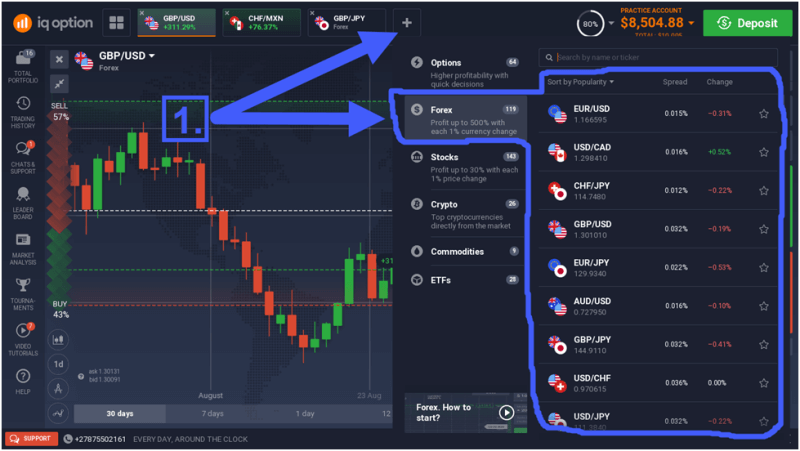 The forex market is huge, and with a daily turnover of trillions of dollars, there is more than enough liquidity to execute large orders in the blink of an eye. Spreads and commissions are generally very low when trading forex, which makes it a popular playground for intraday traders and scalpers. Leverage is almost always available to retail forex traders, which enables them to control large positions with only a fraction of the position’s notional value. 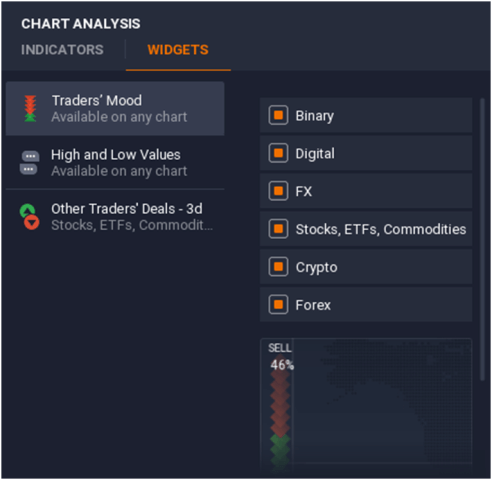 Let’s see which currency pairs are available with IQ Option, and how you can trade it on their top tier platform. In the currency market, two currencies are priced in relation to each other to form a currency pair, for example, the EUR/USD (the euro versus the U.S. dollar). The first currency in this pair (EUR) is the base currency and the second currency (USD) is the quote currency. When a trader buys the EUR/USD currency pair, he essentially buys the euro against the dollar. This is called a long position on the EUR/USD. If he sells the EUR/USD currency pair, he buys the dollar against the euro. This is called a short position on the EUR/USD. When a currency pair is bought, the base currency is bought, while, at the same time, the quote currency is sold. When a pair is sold, the base currency is sold and the quote currency is bought at the same time. When the price moves higher, a long (buy) position makes money; when the price moves lower, a short (sell) position makes money. When a country’s economy grows at a fast pace, its currency tends to attract investors. Economic growth encourages upward pressure on inflation, which may necessitate higher interest rates. When a country’s interest rates rise, the demand for its currency is likely to increase because investors who hold long positions in that currency will receive more yield in the form of carry (interest). Of course, when a country’s economy is booming, more foreign investment capital will enter the country, which in itself creates more demand for that country’s currency. Another important factor that influences the valuation of currency pairs, is risk sentiment. When investors are willing to invest in riskier assets, they tend to borrow money where it is cheap (low-yielding) and buy the higher-yielding assets with the borrowed capital. A simple example of this is when investors borrow Japanese yen (with little or no yield) to buy stocks or higher-yielding currencies, with which they expect to earn a higher return. But when a situation arises wherein these investors become risk-averse for some reason (not willing to take the risk any more), they may choose to sell some of these risky assets and buy back their Japanese yen (which is considered to be a safe haven asset). This causes money to flow from these riskier assets back into Japanese yen, which strengthens the yen. When investors start buying riskier assets again at a later stage, the yen may weaken because money is flowing out of it again. 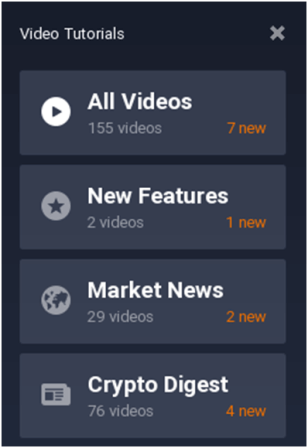 IQ Option’s multi-asset trading platform can be accessed not only via web and desktop apps but also through Android and iOS mobile applications. 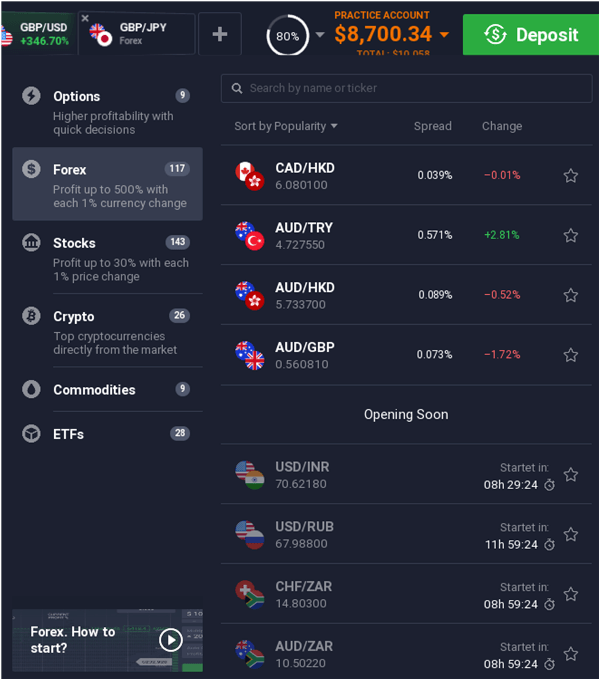 Let’s see which forex pairs are available and how to execute currency trades on IQ Option’s trading platform. It’s hard to believe, but IQ Option has 121 currency pairs available on its trading platform! This is impressive, to say the least. AT THE TIME THIS SCREENSHOT WAS TAKEN (WEDNESDAY AT ABOUT 20:00 GMT), THERE WERE 117 CURRENCY PAIRS OPEN FOR TRADING AND 4 PAIRS WERE CLOSED. How Much Leverage is Available? 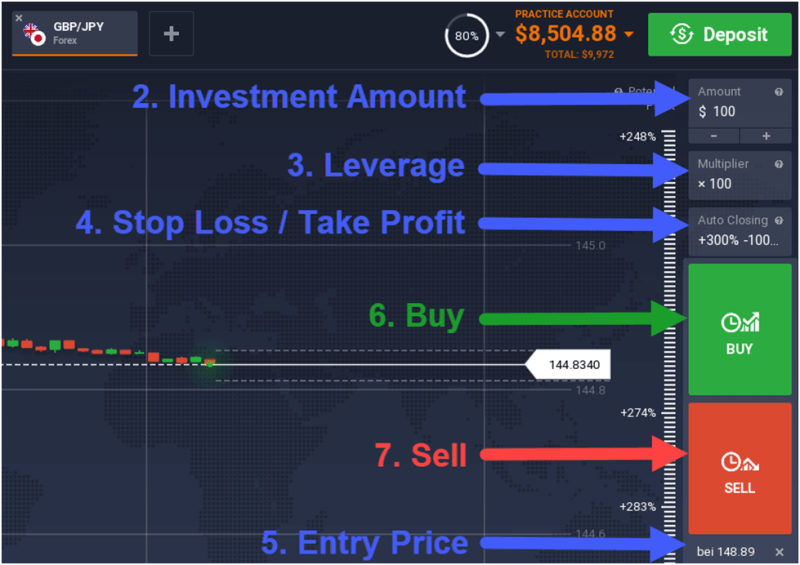 Leverage is what makes it viable for many individuals to partake in the forex market under normal trading conditions (minimum trade size = 0.01 lots). 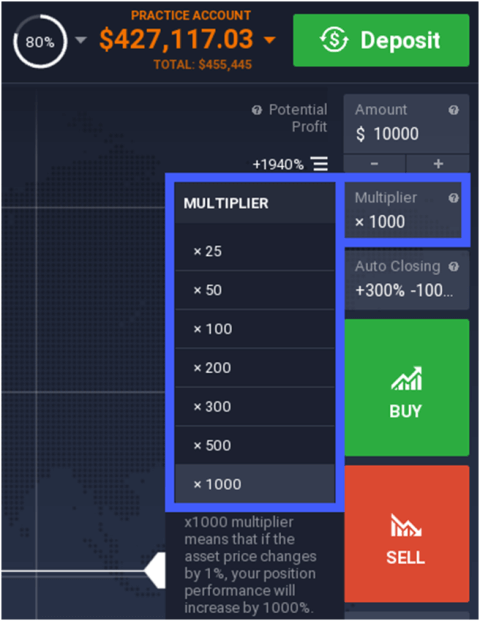 Without access to leverage, a person with a trading account of $250 would not be able to trade forex if the minimum lot size were 0.01 lots, which would require more or less $1000 of capital. Luckily, with IQ Option, small transactions are possible, even if you prefer not to use the lowest leverage setting which is available. Pro EU traders and non-EU traders: up to 1:1000. Retail EU traders: 1:30. These have access to lower leverage because of ESMA (European Securities and Markets Authority) restrictions. 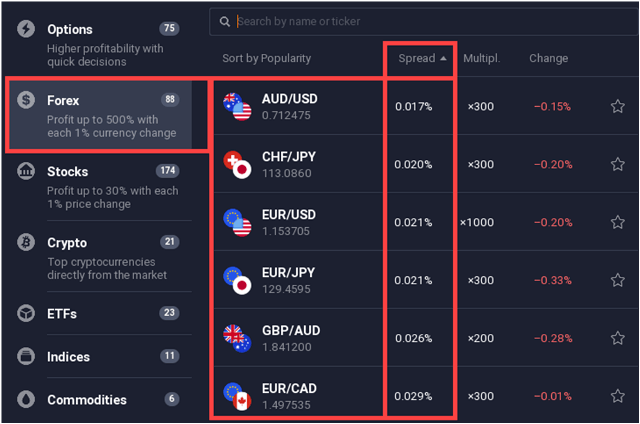 AN EXAMPLE OF SOME OF THE LOWEST FOREX SPREADS ON IQ OPTION’S TRADING PLATFORM. IQ Option’s forex spreads start from about 0.015%. These are floating spreads that change according to market liquidity, news releases, and other factors. The forex market is basically open 24 hours a day, 5 days a week. However, not all of the currency pairs offered by IQ Option can be traded 24/7. Some examples are CHF/ZAR and AUD/ZAR. 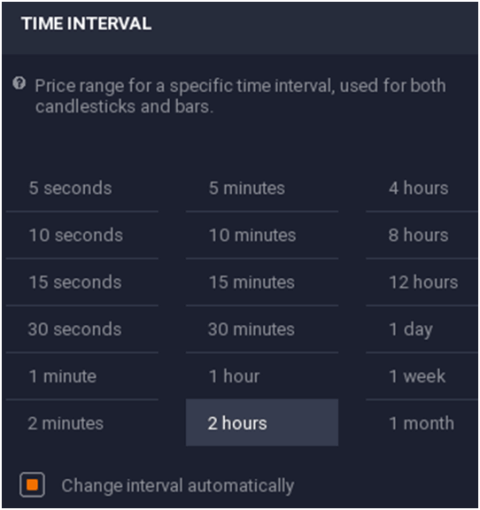 The minimum deal size on IQ Option’s forex pairs is $20. This is the same for all clients from around the world, and for any leverage setting. BY CLICKING “TOP UP”, THIS DEMO ACCOUNT BALANCE WILL BE RESTORED TO THE ORIGINAL VALUE OF $10,000. IQ Option’s platform has many features which make forex trading convenient for its clients. Trade execution is fast, and it is easy to make adjustments to a position’s (or pending order’s) parameters before or after it has been placed. 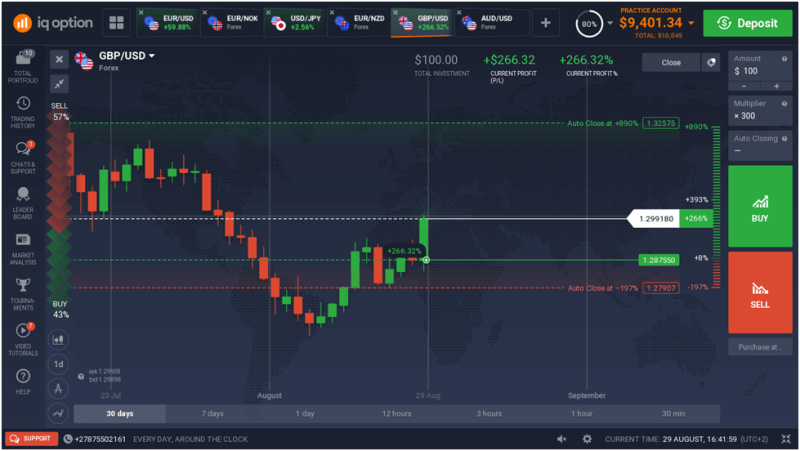 The number of forex pairs available on IQ Option’s trading platform is really good, which is likely to expose clients to more trading opportunities and better portfolio diversification.